When making the above I just jumped right in, and didn't really think to much about it. But after taking a step back I realized just how HUGE and boxy this ship was. I considered going back and stripping the ship and reshaping it a bit, but that just seemed like more trouble than it was worth. 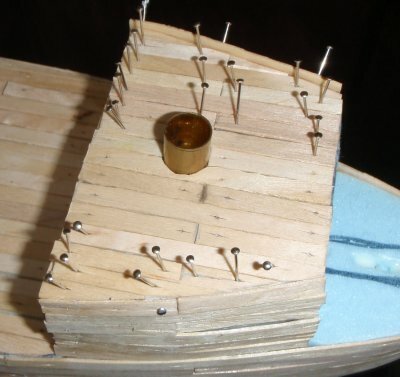 I may finish it at some point and continue with what I started, but right now it is just to big for the vision I have of having a ship in a dock section on a Mordheim table. 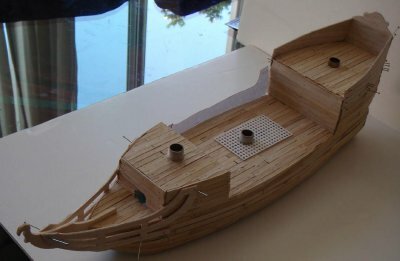 So after a bit more looking around and seeing a few of the other boats here, I decided to give it another go, but this time scale down the project. Once again I set out using foam as a base, and worked out the basic shape. 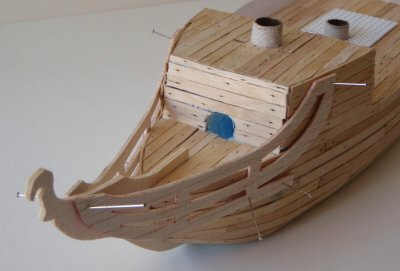 I have been seeing a lot of ships made with the planks made from card, over a basic shape, but I think I still prefer the look of wood / balsa so I am thinking I will go that direction. I am mostly happy with the shape I have now, but might go and refine it a bit more. Anyways, here she is as she sits now. Not using any plans, and just working from various pictures, I think this one has a better ship look to her. Please share your thoughts with me or any suggestions as I stumble further along into ship building. The shape looks good It seems to be in good proporion, Just one question What are the dimentions of your new ship. What ships sre you useing for inpirstion? I think it looks great. 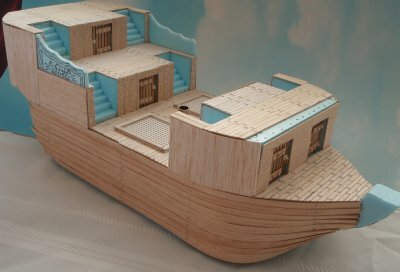 It would make a good ship for the Treasure Ship Scenario. Might I suggest to cut some off of the bottom. You've made the hole ship. You only need the part that sits above the waterline. This is a mistake I made on my ships. Mine sit too high on the water. Cut the bottom layer of foam off, or a little more, and it won't look so big. A FINE LOOKING SHIP!  She has the look of a Spanish or, in War Hammer, Estalian Galleon riding high in the water. If you feel she too high, you just have to paint the water line higher...indicating she's sailing unladened. 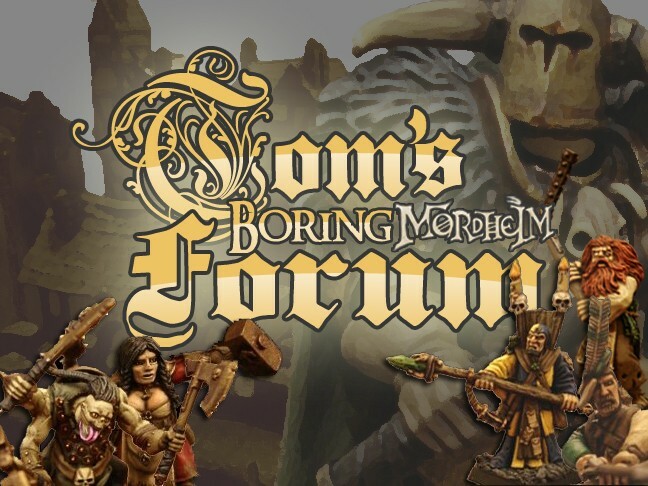 A VERY PROMISING PIECE OF WORK! Well I got some more work done on the ship despite a change to my work schedule. THIS Guide as a rough how to. Rather than use balsa wood, which I felt might have been a bit too fragile I decided to go with using coffee stir sticks. 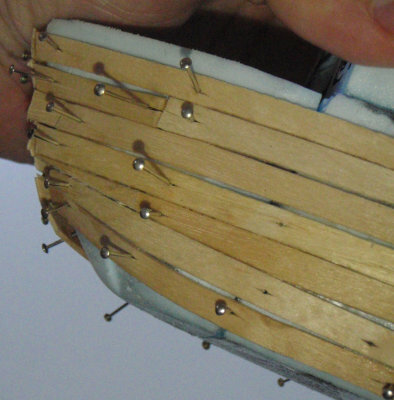 In order to get them to bend, I soaked them in warm water for a few minutes, glued them into place and then pinned them. I have been working small sections at a time and letting it dry overnight before I remove the pins. 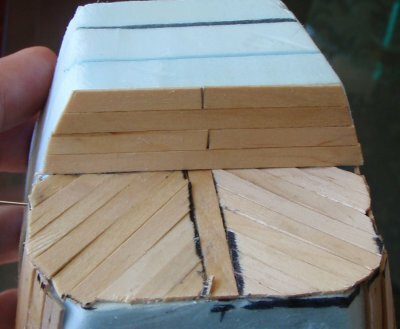 I initially started out using hotglue, but quickly found that the glue didn't stick so well to the wet wood, and the hotglue cooled to fast against the wet wood making it more of a chore to get the planks to lay flat. The whole thing is fairly smooth, but I am noticing slight imperfections. 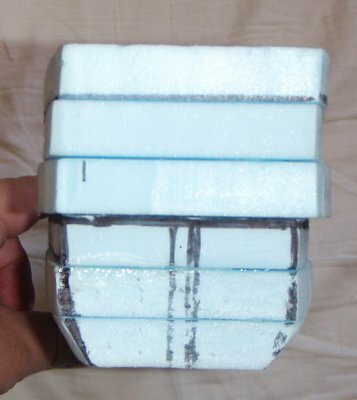 This is mostly from the layer of foam under, which I could have spent more time smoothing. I also cut some brass sleeves for the masts, this will allow me to remove them for easier storage. I will of course be covering over the brass. 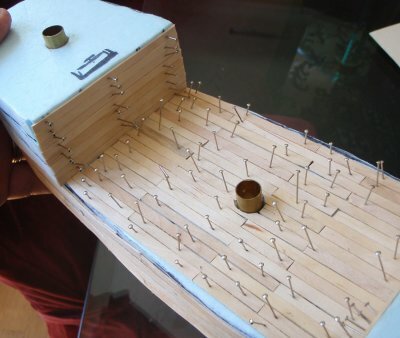 Port side, with most of the pins removed. Shot for scale with some pirates, also gives you an idea of the curve going towards the bow. Shot running down the port side. 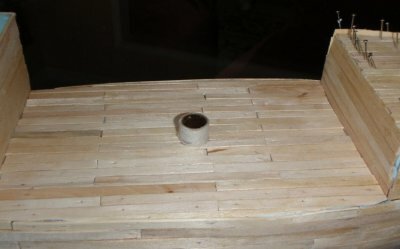 Bending the planks, and trimming them to a nice arch on the bow of the ship I am sort of just doing by feel. Not the pretiest so far, but I think I am getting the hang of it. I had planned to add the keel after I planked, and will be covering / touching some of this up with decoration / anchor / figure head etc.. I am almsot embarrased to show it, but here is a picture. In hindsight, I should have added the keel first as I did with my first ship. As someone mentioned earlier, she sits a bit high. When creating the base shape I had envisioned two rows of guns (I always think a single row looks a bit silly) one on deck, and one below. I wanted to make sure I had enough room. I will most likely be shaving down a few mm from the bottom now. The rest of the planking should go fairly quick as it is mostly squarish. Please let me know what you think, all comments and critques welcome. Oh my, what a lot of work! I was lazy when I did my ships; I just used strips of heavy card. When they're all painted up you can't tell what they're made of. Your's should look great. I'll back up on my post about it being too high. That was directed at the ship in your very first picture. The one you are working on now seems just fine. The size is about right too. 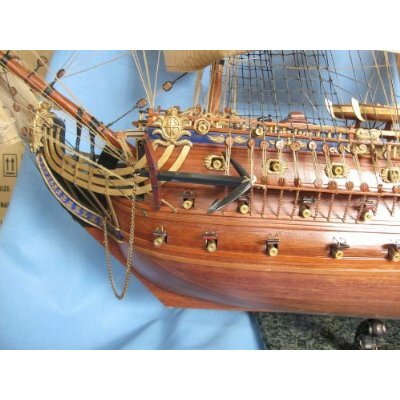 Check these pictures out for sizing your ship. They might be helpful. These are all concidered to be small ships by the Warhammer FB "General's Compendium"
And this is my "Medium" ship. Which sets a little high in the water just like the rest.. 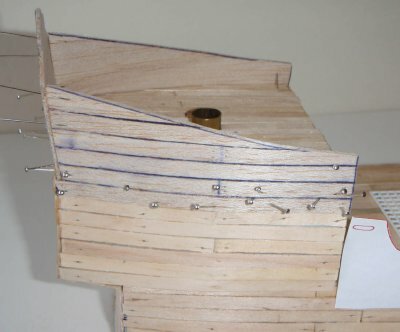 I do have one general criticism/preference although about all the vessels I have seen so far for Mordheim/Pirate battles: The hulls all taper inwards towards the waterline (smaller profile than the deck), when in fact the widest part of the hull should still be under the water thus the tapering should be outward. I know this is probably for boarding and practicality reasons. So nevermind that, just thought I would remark. Anyway I love the new vessel. I hope at some point you may finish the first "blocky" one as well, I think when you add mouldings, and wooden detailing bit you might be able to hide a lot of the "blockyness". 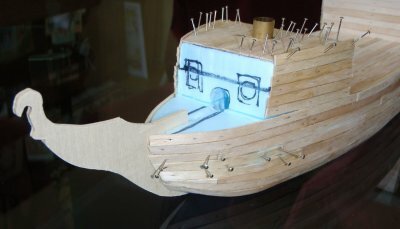 You're a braver man than moi...I just carve the planking into my ships. I'm sure all the effort will pay dividends. Keep up the GOOD WORK! A tad bit slow on the updates, been working a different shift at work. 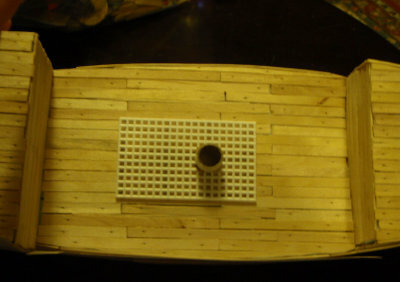 Mostly done with rough planking now, finished the main deck, still have to plank the upper sections. I hope to have all the rough planking done in the next day or so. Here are a few WIP shot updates. and a side shot with rough planking. 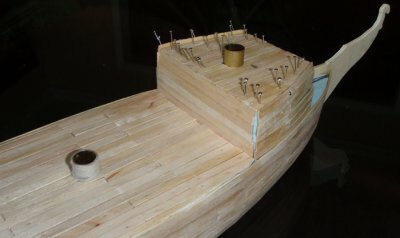 After the rough planking I will start in on the siding, cannon ports, keel, rudder etc. Looking good it has come along nicely and cant wait to see it completely board up. Got some work done on the bow last night, here are some WIP shots. I fixed a spot on the side that was really bothering me, it blends in better now. And a shot of the opposite side. I also covered one of the mast ports, here is a shot of how the front half looks now. 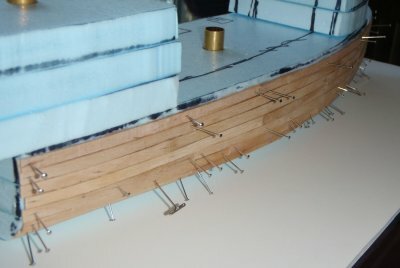 A close up shot of the finished main deck, and mast port. I stll plan on adding some grating. 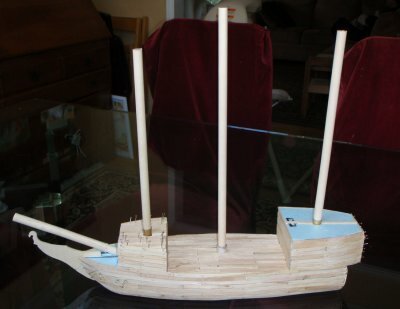 I cut some dowels to length for the masts, just to get an idea of how she might look, I will most likely make some adjustments. I also plan on having crows nests etc.. So there she is, I think it is coming along nicely, still lots of work yet to do, but the rough frame is more or less complete. Any comments / suggestions are always welcome. VERY NICE piece of work! She's a FINE LOOKING ship...you come up with a name yet? I LOVE the way the prow looks. just cause it's the 19th of september... Yarrr! be turning into a fine vessel me hearty! Did a bit more work on the front of the ship after looking at various pictures of tall ships, I thought it needed a bit more decoration. So I took the Gary Chalk plans remembering there was a decorative bit for the front, and stretched the design a bit to fit my needs. Here are a few pictures with the design taped on (one side only), not quite sure how I feel about it. I am considering adding putty or something like that to round it out and make it look a bit more decorative. I might work to come up with my own design, maybe something that fits the ship a bit better. I really can't decide. There is still plenty of room for adding my figure head that I have planned which is good. Also working with some granny grating to create the desk grating. 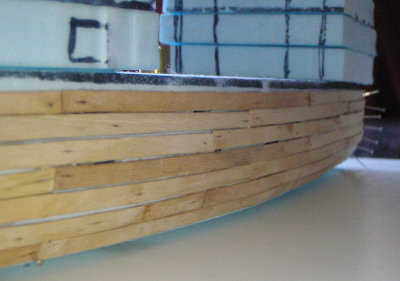 I will border this with balsa to blend it into the deck, this is just me trying to get a rough idea of the size I want. I think this looks about right. I plan on making it into a 2x3 grid. VERY CLASSY...you're going to have to spring for a REALLY COOL LOOKING Crew. Wows! 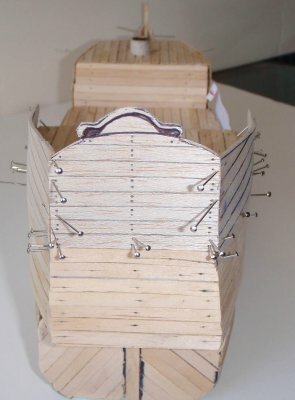 This makes me want to make a pirate ship...If I ever get back to having a little bit of time to spare! Very cool! 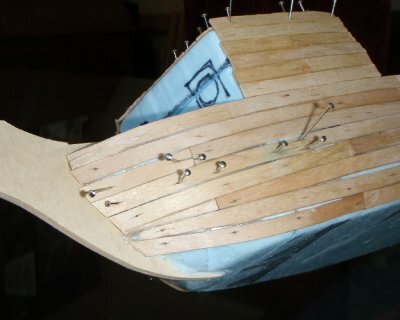 The ship's coming along nicely! Thanks for the comments. Always helpful to keep things moving along. I have hit a point in the design process where I actually need to think things out a bit. I hope to get some more work done on it this weekend. I am currently working on the railings, I was initially planning to use some decorative beads, but they dont quite look right, so I have to re-think that. 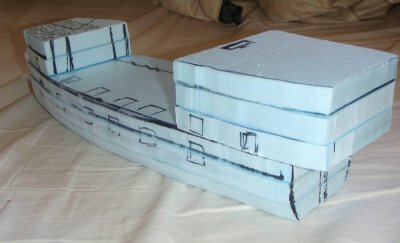 I also plan to extend the aft part up a bit so I can put a crest, the ship name and some decorations etc. I was considering putting a little gallery(I think they call it) type section on the rear, but this ship might be to small for that. 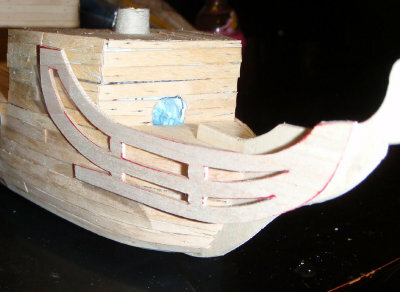 I am also playing around with using putty / clay to add some details to the railings and the bow. She's coming along very nicely! Got some more work done on the ship. Glued into place the front bow detail, I am fairly pleased with the way it looks. I still plant to detail it a bit more, but that will be towards the end. 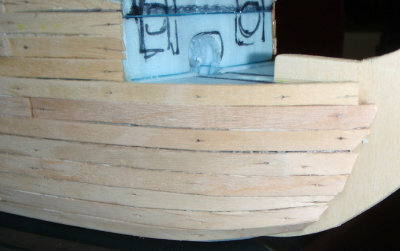 I also raised up the aft section to look more like pictures I have been seeing of tall ships on the web. thats looks great! amitious and well carried out. look at some reference material on masts to get the staggered look of tall ships. they tend to be in sections adn rather thin. Good choice with the GoW ships, by the way. 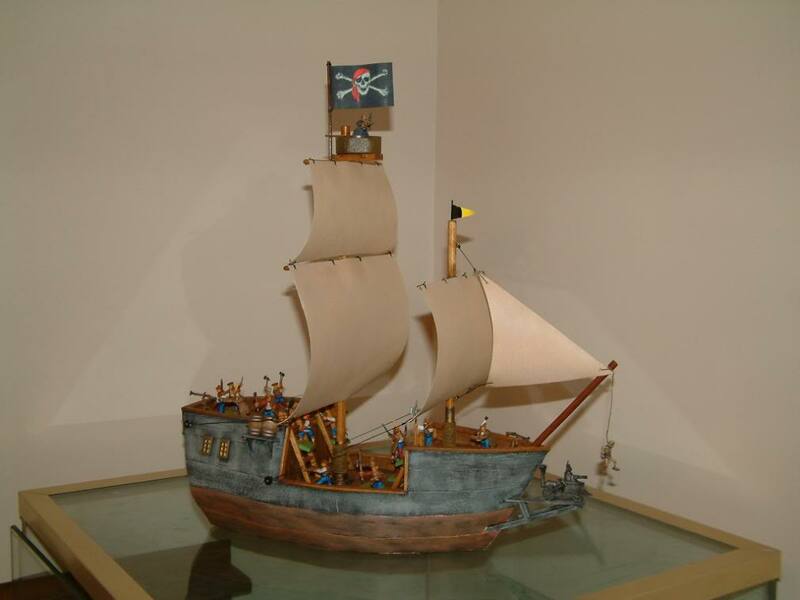 Your pirate ship is looking really nice! So much intricate woodwork, that will look really nice painted. I just can't resist showing this shipwreck from UK games day! Watch out for those reefs!